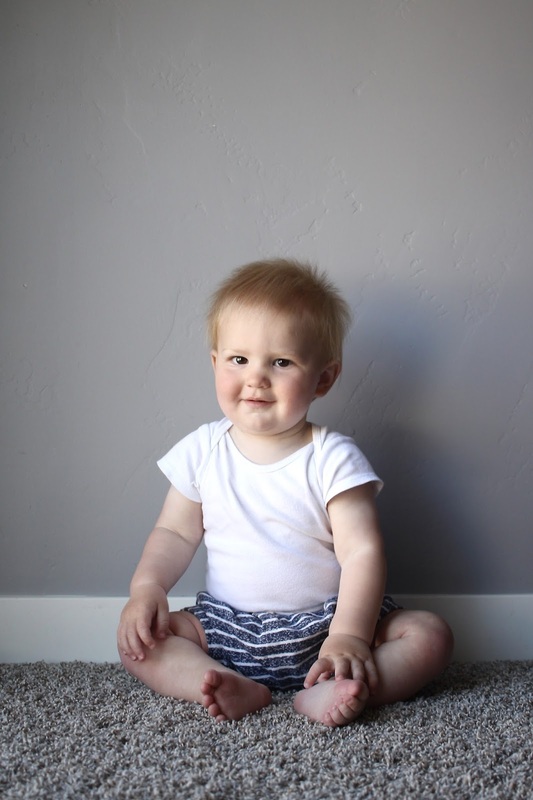 We still have a month until this sweet boy turns 1, but I feel like the baby in him is officially gone. He's this new, strong-willed boy who has an opinion about all sorts of things and knows what he wants when he wants it. He understands us, and slowly we are understanding him too. 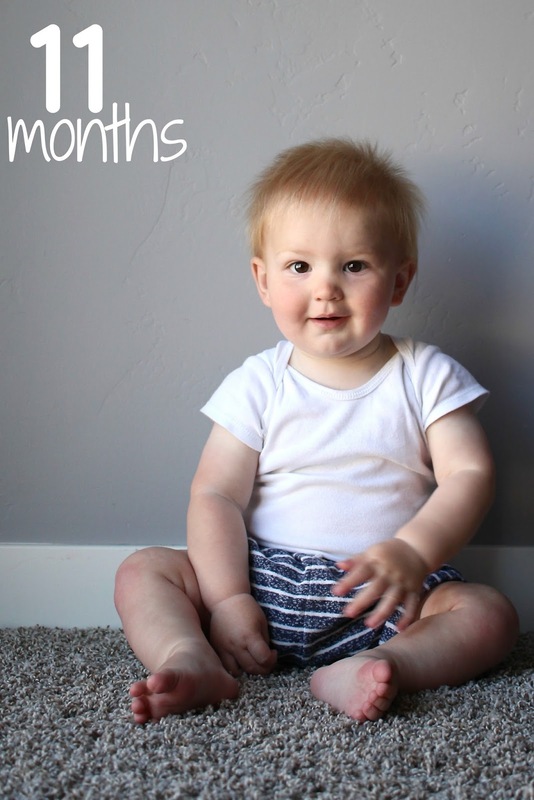 This month brought lots of growth spurts and new skills, which aged him far too quickly for my liking. Eating: Raspberries are by far the favorite, with blueberries a close second, followed by applesauce. I craved fruit my entire pregnancy with him, so this totally fits. He seriously eats mostly fruit (other than breastmilk of course), but at least tries other foods. He sampled some asparagus the other night and seemed to be into it. Allergies: Big news here!!! Finn is over his dairy allergy! I think... He is at least tolerating the dairy that I eat now. We are still waiting a little longer to introduce dairy straight to his system. But let me tell you how amazing that first piece of cheese was after 3 months without it! I'm still planning a post all about this; I just simply need to find the time to get it down in words. But of course, as we let one allergy go, another pops up. It seems that Finn may be allergic to grass. This doesn't surprise me since all last fall he would have slightly red and watery eyes when we were outside. Now that he is crawling around in the grass, it gets all over him and flares up his eczema pretty quickly. The good news is that Finn doesn't seem that bothered by it, and after a bath at the end of the day, his skin seems to go back to normal pretty quickly. We are going to keep an eye on it and see how he does as Spring continues to blossom all around us. Sleeping: He's consistent, but the nighttime is not amazing. As I have shared before, it's what I expected, and most of the time I manage my sleep deprivation just fine. He typically sleeps from about 8:00pm to 7:30am, but wakes frequently to nurse or snuggle (probably 5-ish times per night). The cosleeping makes this a breeze, and we easily both go back to sleep. He still naps twice a day (Liam hung on to two naps until he was 18 months), both about 1.5 hours if we happen to be napping at home. But typically one nap is on the go, these days and sometimes both. I don't really plan our day around his nap schedule, he just gets one when he can! Likes: Balls. New obsession. He is perfectly content to throw a ball, chase it down, repeat. He is proving to be my little athlete already. Still a lover of animals, especially dogs (which may have been his first word after mama & dada). He gets so excited when we go to the zoo, farm, aquarium, aviary, etc. I can feel his little body just start wiggling, kicking and reaching out pointing as soon as he spots a new animal. He also seems to also be enjoying Liam's wrestling sessions a tad more, but only for a short amount of time. It will be so interesting to see my two boys play together as Finn gets bigger & stronger. He loves dancing, and will instantly start moving when he hears a good beat. He's a big lounger, especially in his highchair, just sitting back with a foot sometimes propped up while he eats. And one thing Finn really does NOT like.... being tossed in the air! I think it's one of the joys of being a baby, but no. Finn grips our shirt as tight as possible and gives a look of shear fear. Hopefully he gets a bit more adventurous soon if he thinks he's going to keep up with his climbing jumping big brother. Milestones: Lots of talking this month! I thought Liam was quite the early talker, but looking back at his updates, he hadn't started this early. Finn has the beginning sounds down for at least 20 words, and is always trying to repeat us. Some words are much clearer than others. But he does have a few definite words: dog, ball, & more. He also says oh, whoa, & wow, but I'm not quite sure those count. And on top of all this chatter, he is standing! 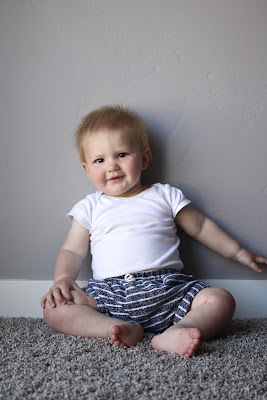 He has no problem getting into a standing position and will do it nearly all day long and is gaining balance more and more each day, but he has still yet to take a step without a firm grip on our hands or whatever furniture is near by. Liam was already full blown walking by this point, so I'm feeling a bit antsy for Finn to be as well. So many new developments, along with two new top teeth, may have contributed to the poor sleep, but I'm not convinced! Nicknames: Finnier, Finnaroo, Finner, Finny, & Huckleberry. These are seriously all the names that Liam uses for him. I'm anxious to see which one really sticks over the years. I love the boy that Finn is becoming. He has the same sweet demeanor as Liam, but in no way has the same gentle spirit. Finn is our bulldozer. He crawls on top of everything and is always determined. He's animated with his hands and his loud voice. He is a lover & a smuggler. He is especially fond of his daddy. He nestles his head right into our chest and just melts our heart whenever he's feeling bashful or sleepy. Life is good with this boy, and things haven't gotten to crazy for me with all the testosterone in the house. At least, not quite yet! Yay that you can eat dairy again!!! Sorry to hear Finn is sensitive to grass, especially since you guys love to be outdoors. And wow, he really is an early talker!!! Oh what a handsome little boy! Just love him. Yay for getting over his dairy allergy. That's such great news. Go Finn! I love all of his nicknames. Ha ha! I just love him, Laura! Woohoo for overcoming the dairy allergy! But boo for the grass allergy. Hopefully that's one that Finn will grow out of as well. Poor Finn, you're all trying to toss him in the air and he just hangs on for dear life. Happy 11 Months, sweet little man!! Take your time on this next month, there's really no need to rush to one-year status. Yay for cheese!! So glad you can incorporate some dairy in your diet again! And Reid walked around 13-14 months. That was so late considering Carter was walking at 10 months! I absolutely love reading up on Finn every month! He is really becoming such a handsome baby boy, I see parts of Liam in him, as well as you and Conor, but it's nice to see the features of all of you come out in him. Sophie loves fruit! It was one of the first things she ate, and now she's moved on to bigger and more adult food, but she loves her fruits, that girl will go through peaches like nobody's business. Overjoyed to hear that Finn is handling dairy better!!! And oh and wow definitely count as words! When Sophie learned oh, all she said was oh, oooohhhh, ooooh, all the time at everything and nothing. Now she says it when exciting things happen like opening of packages. Finn!!! I just love his hair! Seriously, that fluffy hair gets me! I don't know how you are still getting up 5 times in the night, mama. We are doing about 3 and it's killing me, especially after having a first baby who slept through the night at 6 weeks and never looked back, and Charlie started out so promising too.....and, oh, whoa and wow - definitely words!! Go Finn! ELEVEN MONTHS? How did this happen!! I love the little person he's become! Asparagus - go Finn! He reminds me of my friend who has 1 year old Graham, and his older brother is Finn! But Graham is the bulldozer, too! Your Finn is SO CUTE! I can't believe he's almost 1! He's a damn cute bulldozer. And HORRAY for (hopefully!) no more dairy allergy!! We waited forever and ever and ever to give k dairy. And turns out she was just allergic to the kitty (go figure). I love that he is a bulldozer. Hilarious.